Month end. 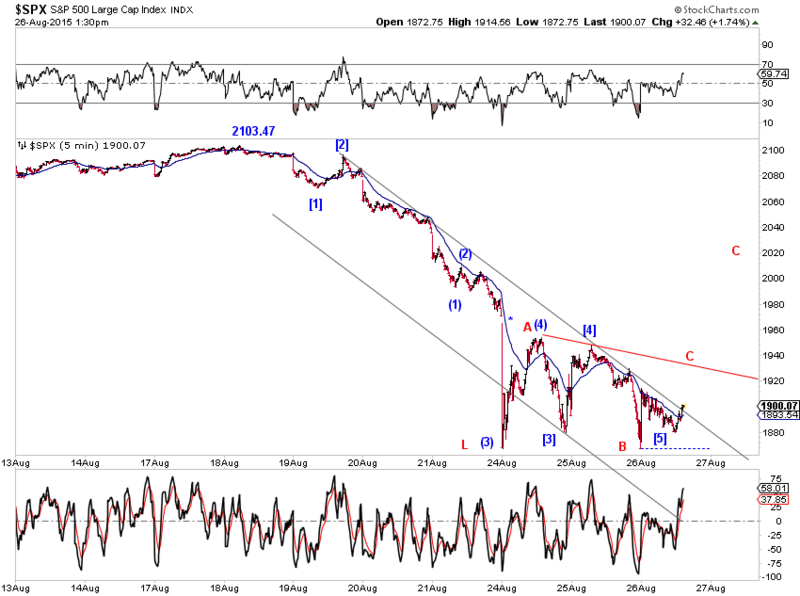 SPX pulls back from TL resistance. See charts. The August plunge in stocks has the potential be a fourth wave correction. Since Monday's low came at larger degree support levels, the correction in price could be (nearly) over while the correction in time has more flexibility. 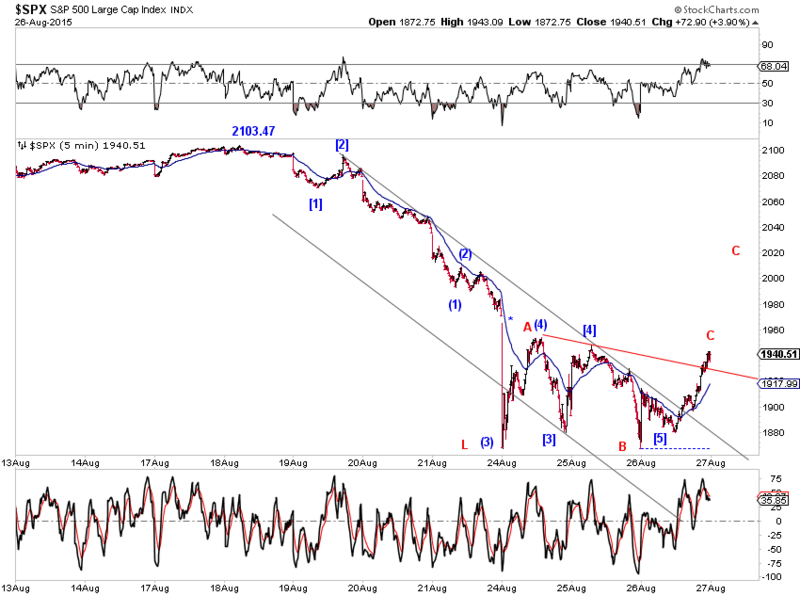 The Dow Transports presents a fourth wave pullback with respect to its 2011 low and has retraced about Fib-0.382 of the third wave advance in this context (Chart S1). 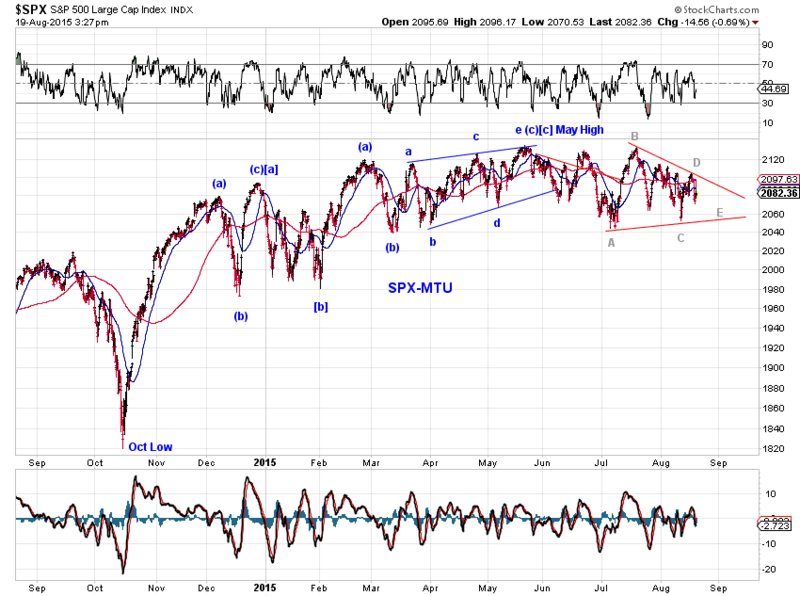 In SP500, we have a potential fourth wave in two degrees, with respect to the 2011 low or the 2009 bottom (Chart S2). Note that Monday's low terminated around the mid-channel line as well as the purple megaphone boundary. If these support levels fail, the next support is around low 1700s, the lower channel line. 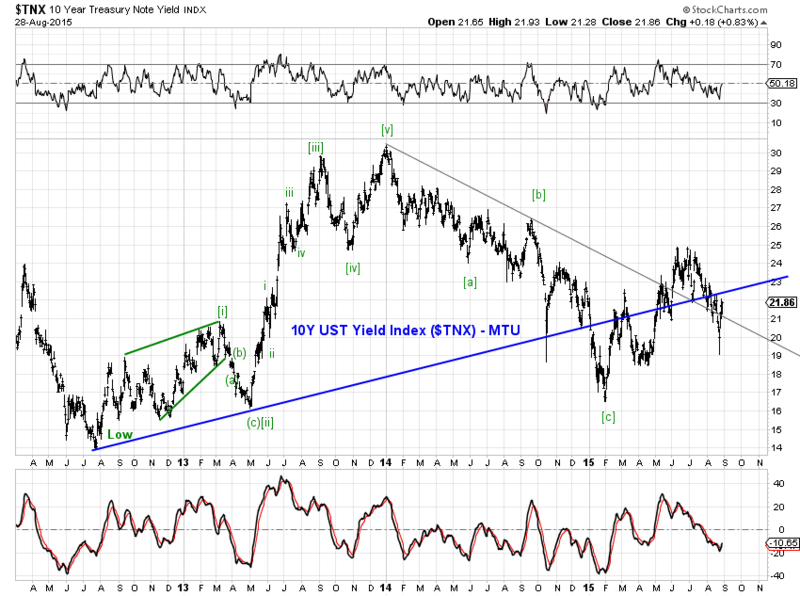 UST10Y yield index rebounded off a small-degree EDT and is back inside its prior breakout territory (Chart B1). 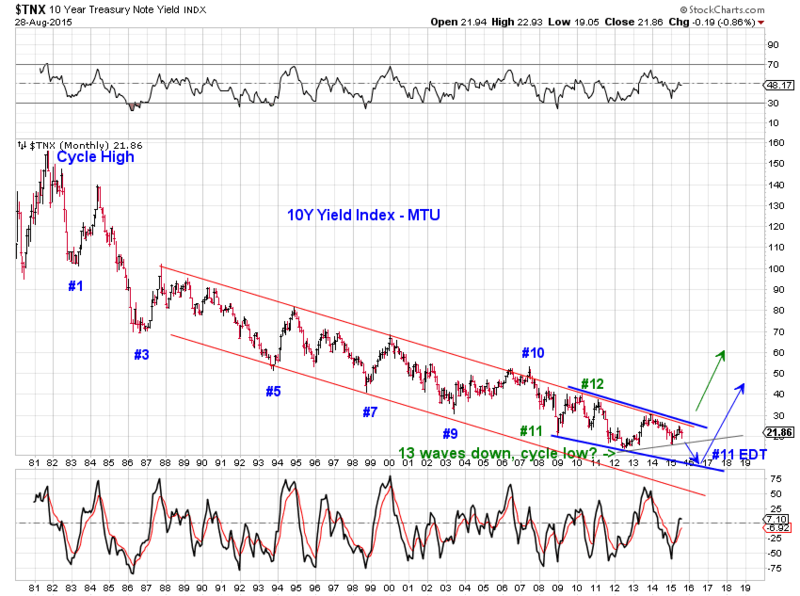 If the momentum keeps up, yields could be ready for another run higher towards their long term resistance (Chart B2). 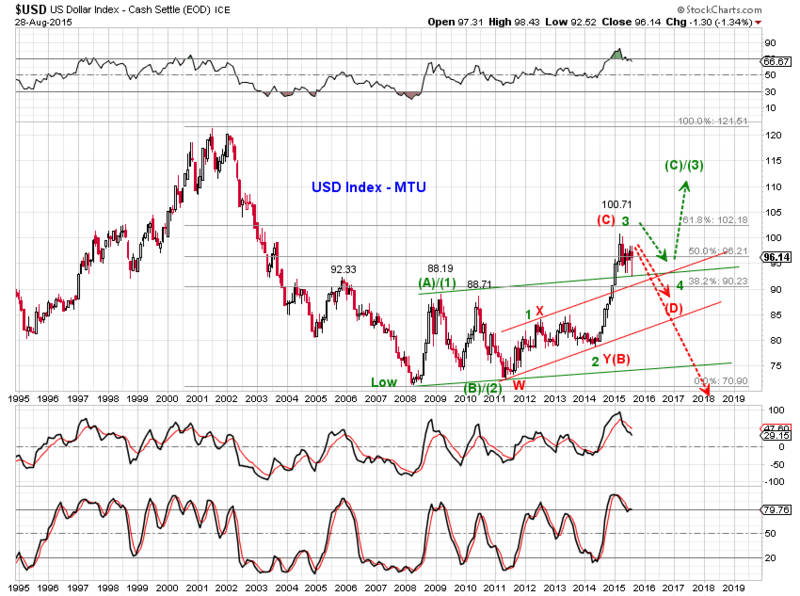 The USD index has retraced Fib-0.382 of its 2014-15 advance (Chart $1) and successfully retested the green trend channel support (Chart $2) and has the potential to make another run higher, if near term resistance is taken out (Chart $3). 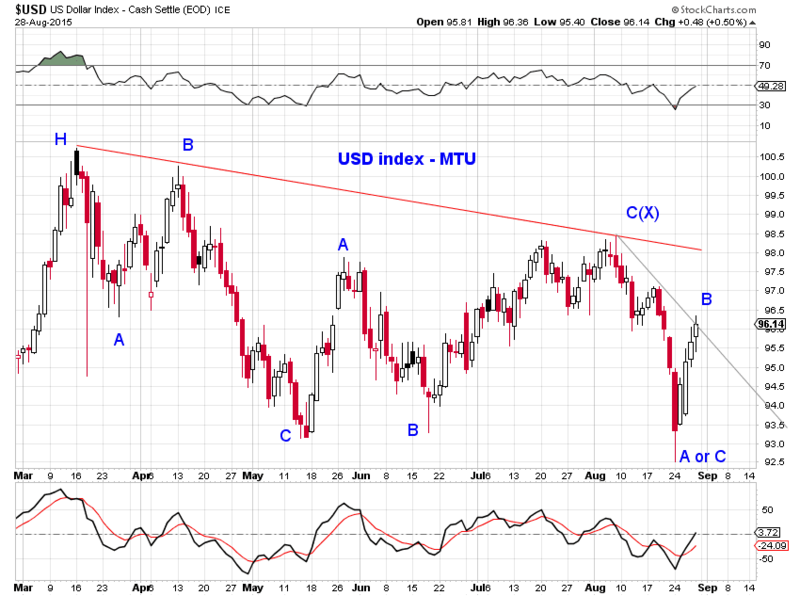 Otherwise, the USD index remains technically overbought and could continue to probe for support and consolidate in time. 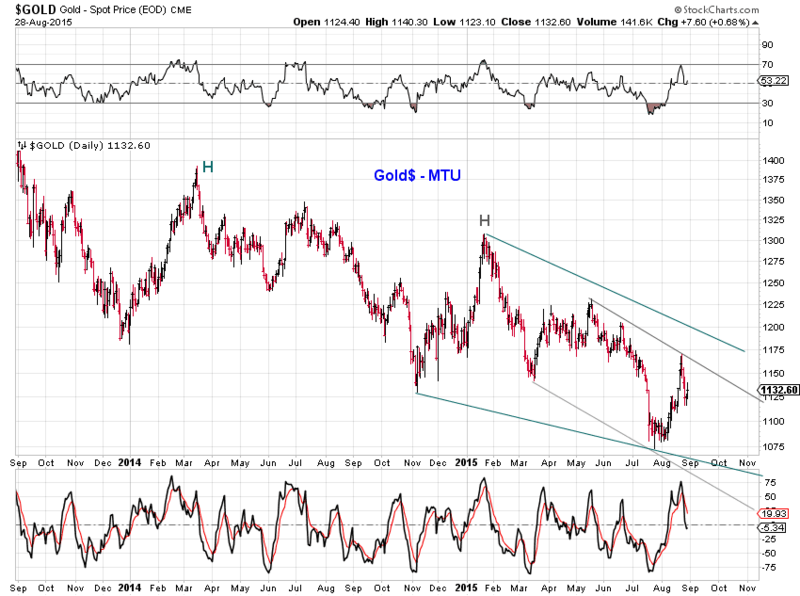 Gold did rebounded from the first target low basedon one of the three tracking scenarios(Chart G1, red C). As long as Gold is below its August high as well as below $1300, the bearish gray and green EDTs remain valid though(Chart G1 and G2). 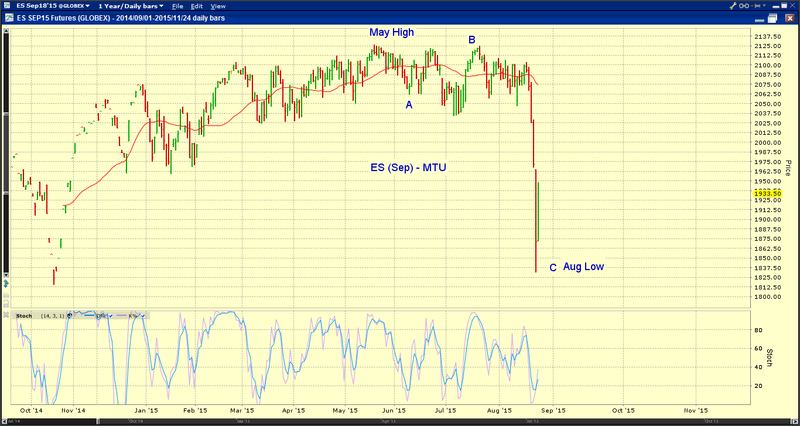 ES is making attempt to gap up the cash market as one of the scenarios discussed at yesterday's EOD update. See chart. 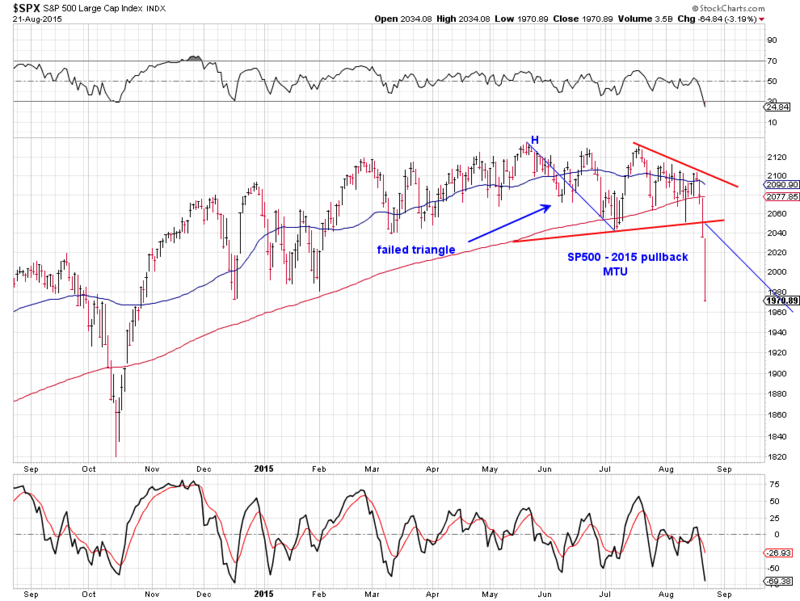 SP500 closed above the purple line, regained its prior range of a potential expanding EDT. See chart 1 and chart 2. 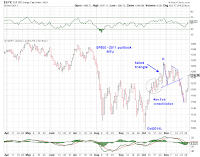 Near term, SP500 is probing several overhead resistance levels, which may take an upward gap or some consolidation to overcome. See chart 3 and chart 4. 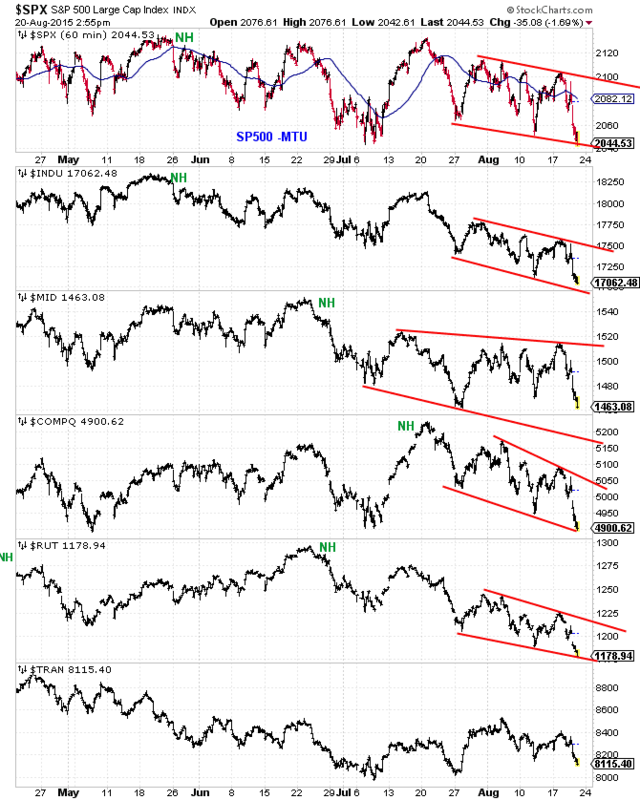 The Dow's breach of its October low today suggests that the upswing and down-swing since Oct 2014 low is not wave (1) and (2) of -up (Green (1) and (2) count in this chart). 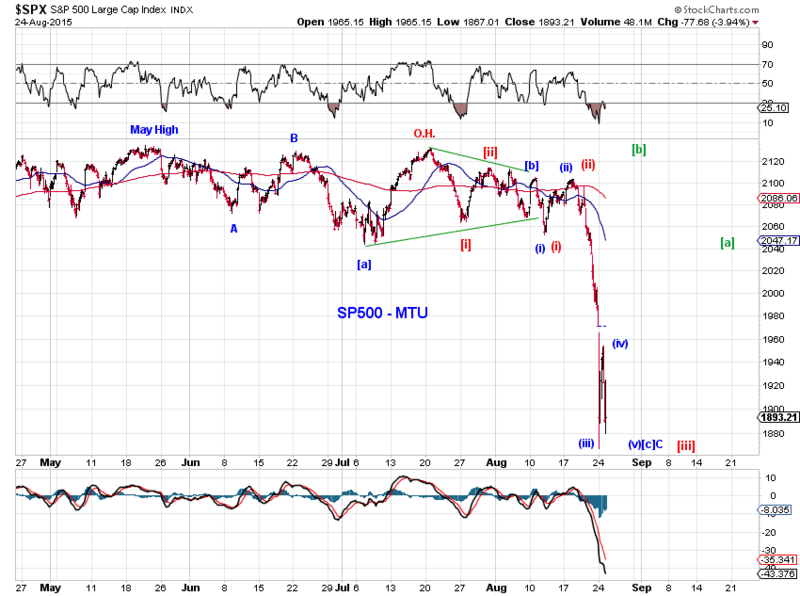 This leaves the green , gray (4) and blue (4) on SP500 in Chart 1, with squiggles in Chart 2. 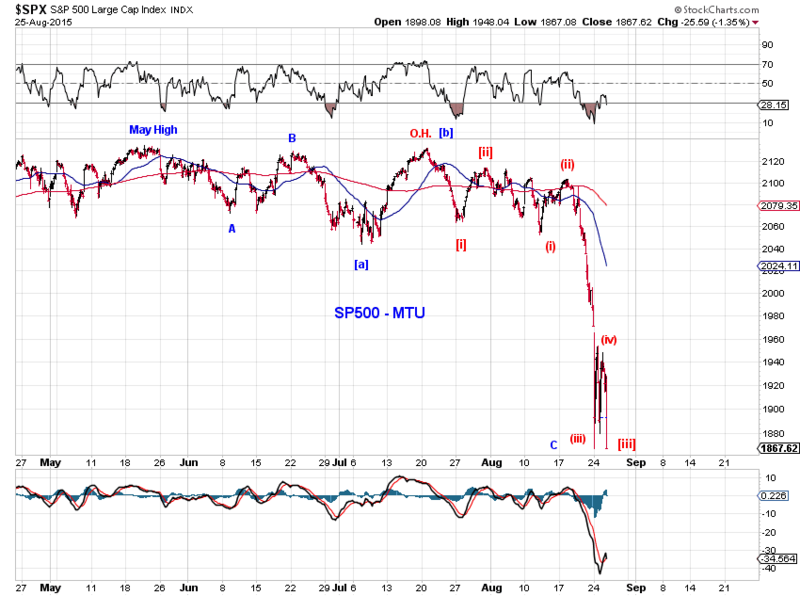 Note that SP500 closed around the purple asy. 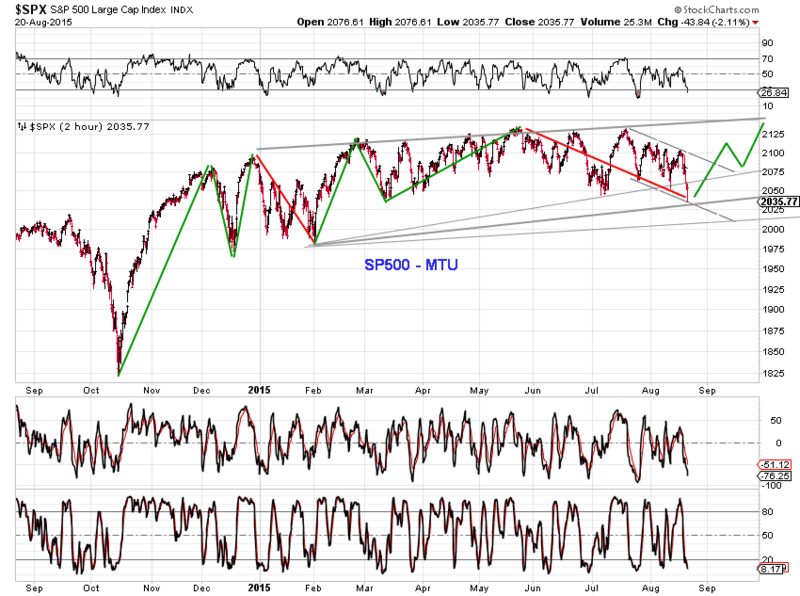 triangle trendline. 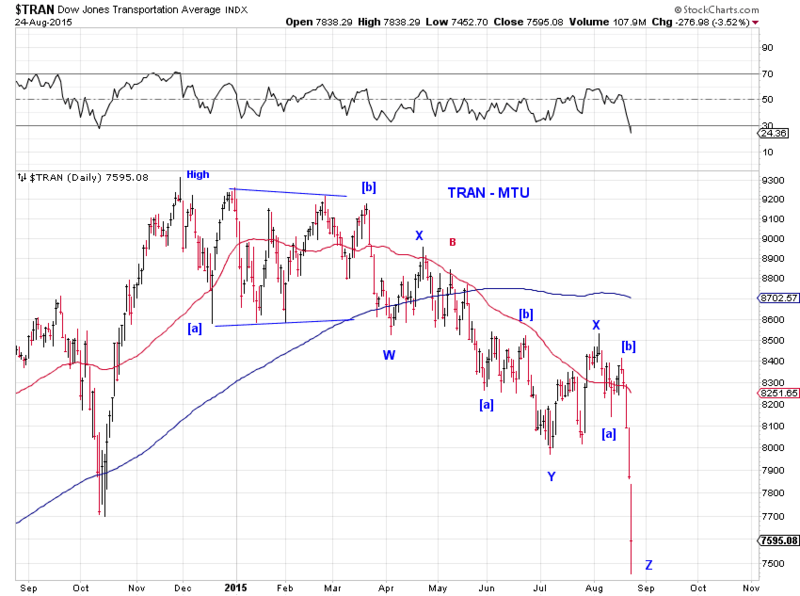 Transports have retraced about fib-0.382 of the advance since its 2011 low and continue to present a fourth wave option (Chart 3 & 4). 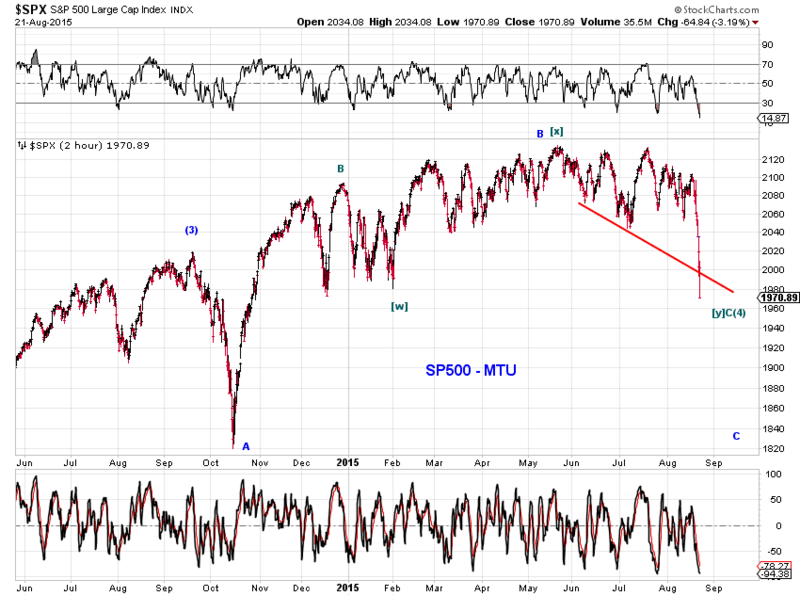 Overnight plunge, likely fills the mid-Oct2014 gap in the cash index. The recent “plunge” in stocks confirmed a correction against the 2014 low and raised the likelihood of a larger-degree correction (particularly with respect to the late 2011 low). 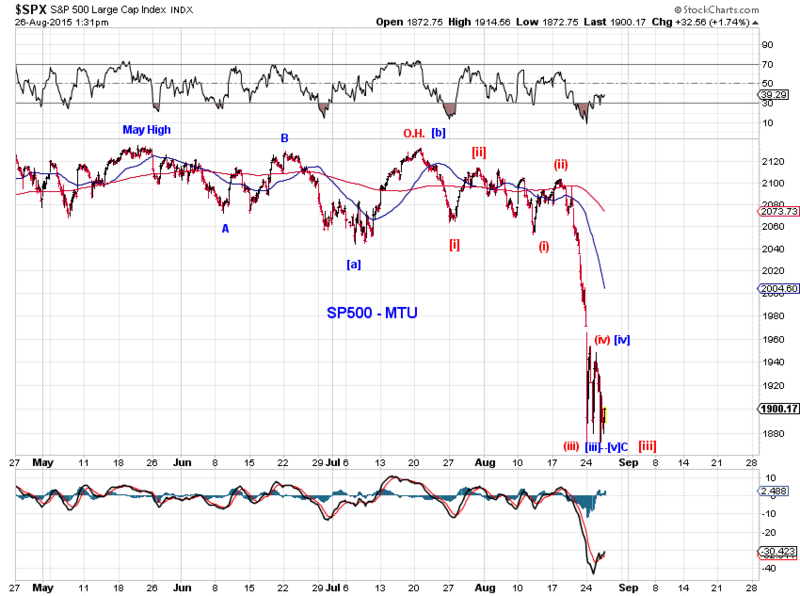 As of Friday’s low, SP500 is down 7.59% from its all-time high and the Dow is 10.31% off its May high. 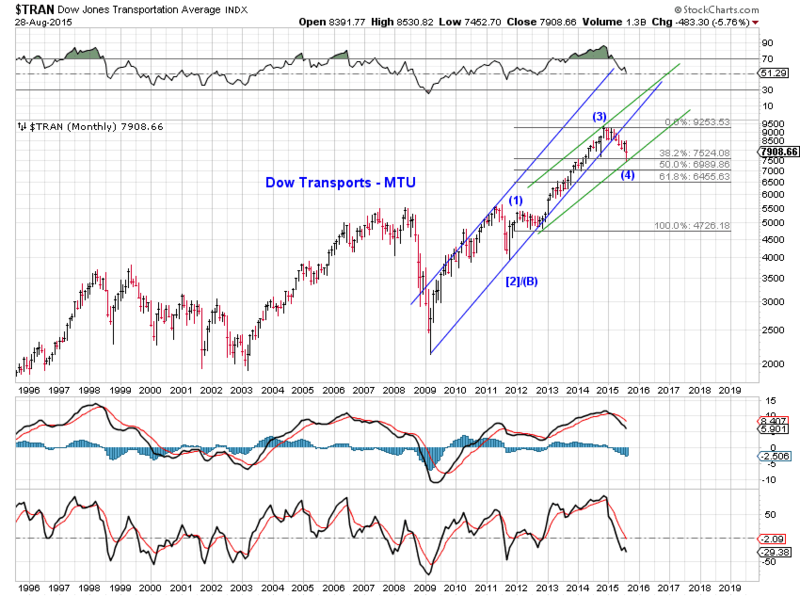 Based on the price structure of the Dow transports (Chart 1), recent weakness in stocks is likely a wave (4) correction with respect to the 2011 low (Chart 4 gray or blue) and price is at initial support. 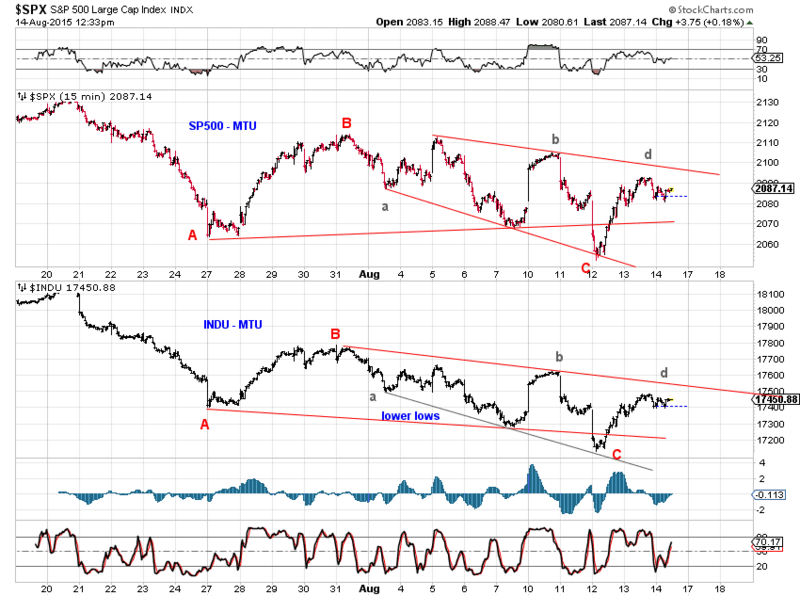 Under this interpretation, the next upswing completes wave (5) of . 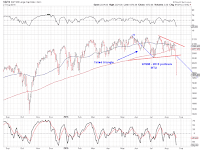 Furthermore, this 2015 pullback in SP500 so far resembles its 2011 pullback where a potential bullish triangle had failed. 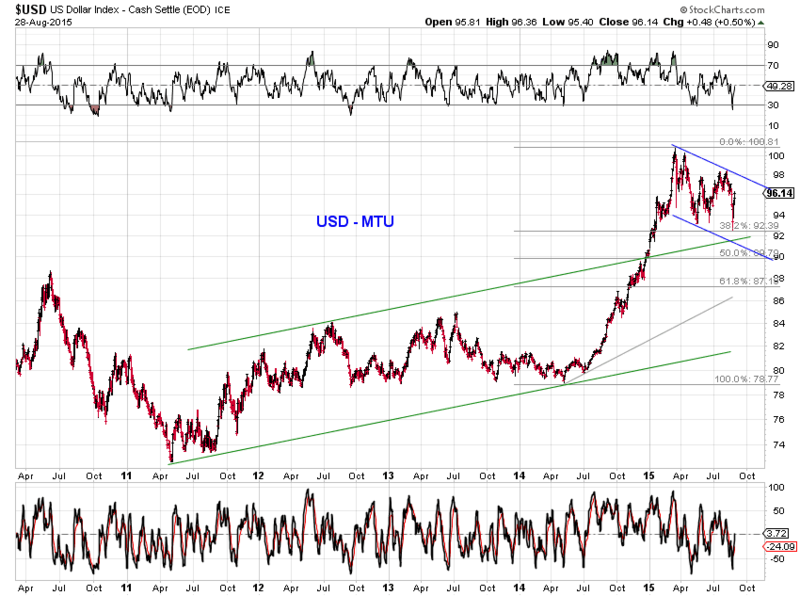 Price is at potential support according to this similarity. See Chart 2 and Chart 3. 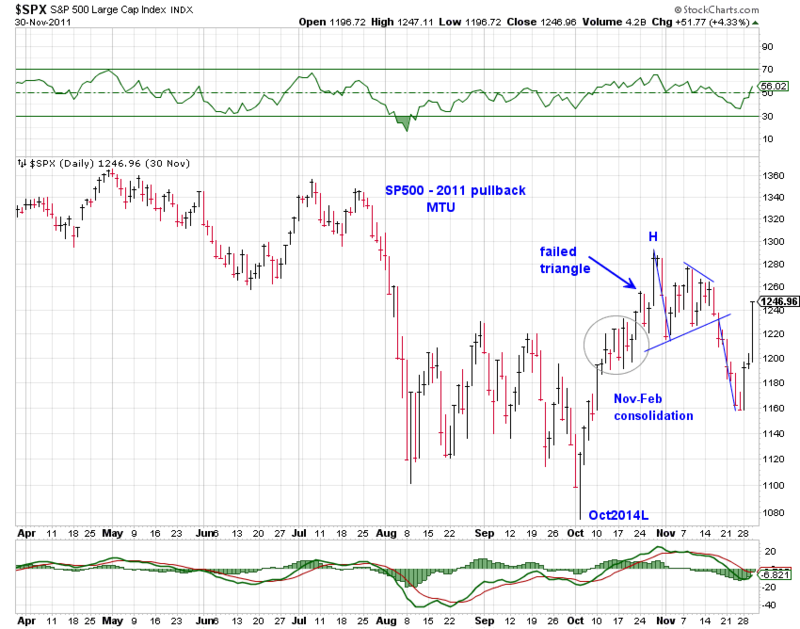 As we have discussed in recent weeks, a meaningful pullback likely sets a better footing for the next upswing. 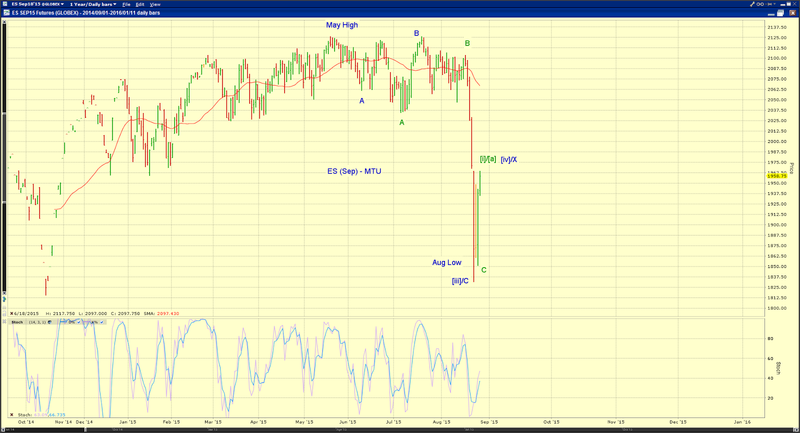 Chart 4 considers the current decline in SP500. 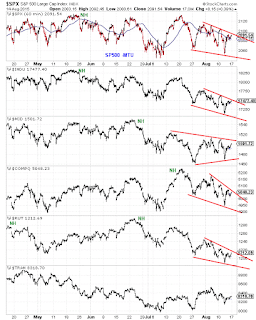 Since the initial decline from its all-time high is a visual three waves (see Chart 6), the sell-off (which has ample potential) is likely corrective, despite the technical damage it has already inflicted. 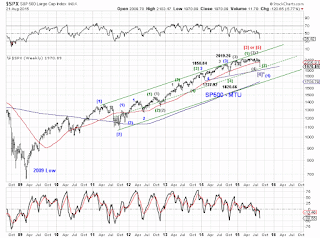 blue wave (4) - with respect to the 2011 low is a flat-like structure. While transports are at their initial channel support, SP500 is just approaching its mid-channel support and has met minimum retracement requirement when wave c fell below 2019.26, especially if a running flat-like structure (Chart 5, green) is developing (which is not unlikely considering other tracking counts). Otherwise the prior wave 4 area (1737.92-1850.84) is fair game. 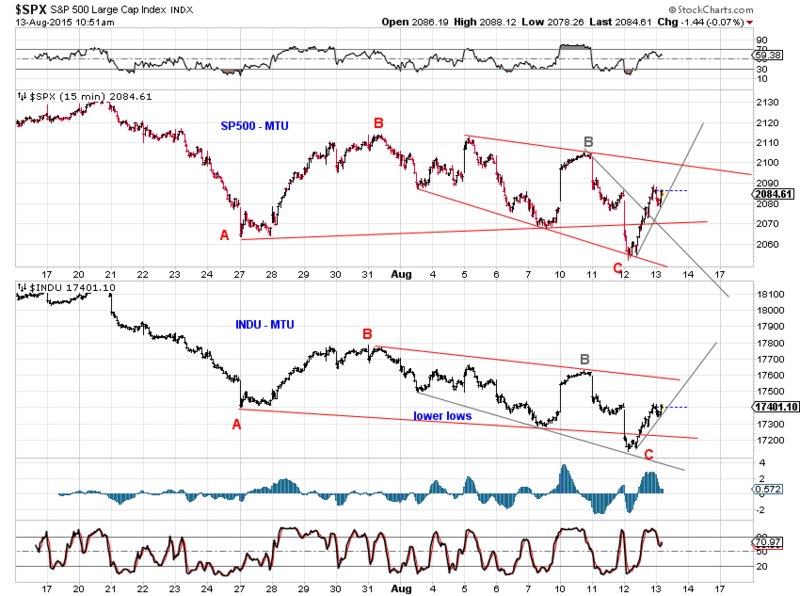 Under this interpretation, the next upswing completes wave (5) of . 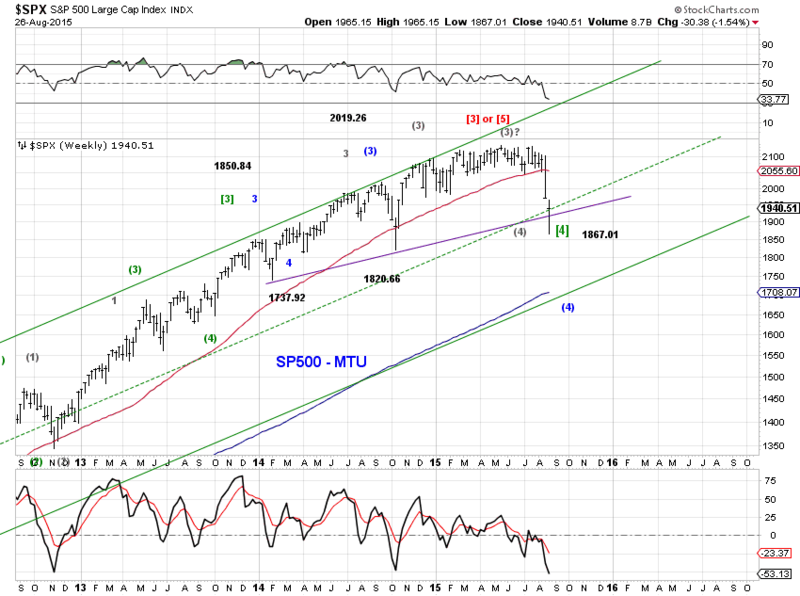 purple wave* - with respect to the 2009 bottom is an asymmetric triangle dating back to the green wave  at the end of 2013. 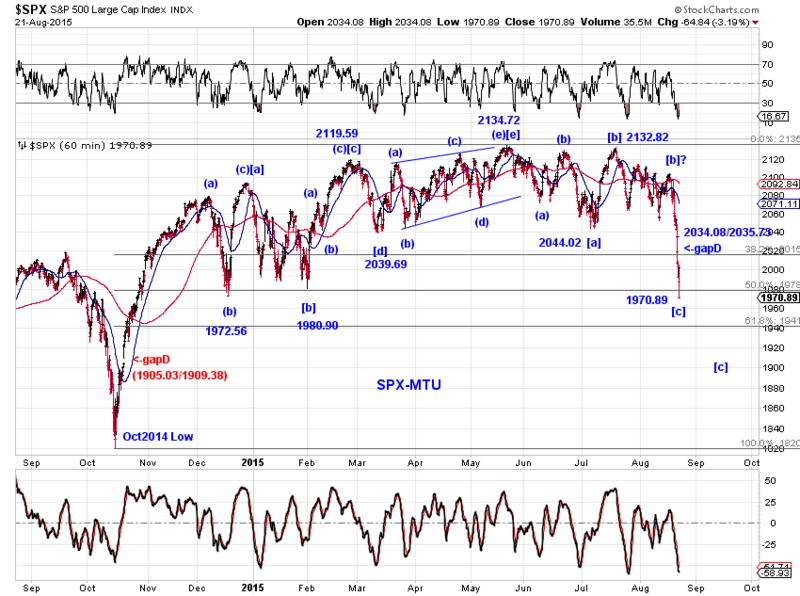 The lower boundary line is currently at 1925 and rising. 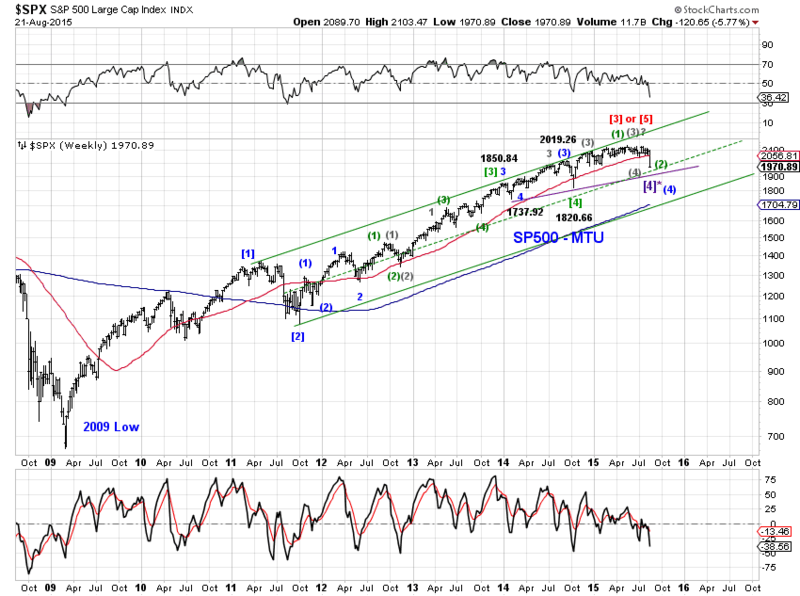 green wave (2) - is correcting the green wave (1) advance since the October 2014 green wave  low. 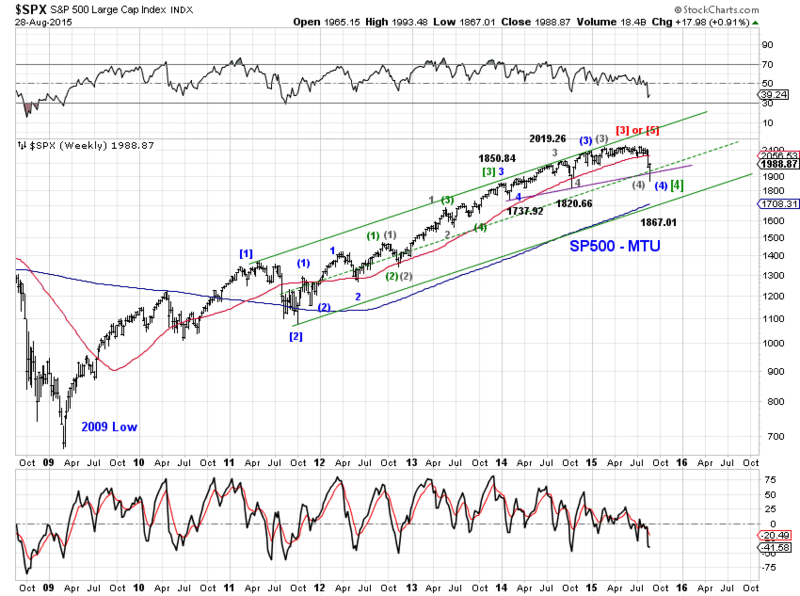 From the all-time high in May, there have been 7 waves during the decline, which suggests that an end is in sight (Chart 6). 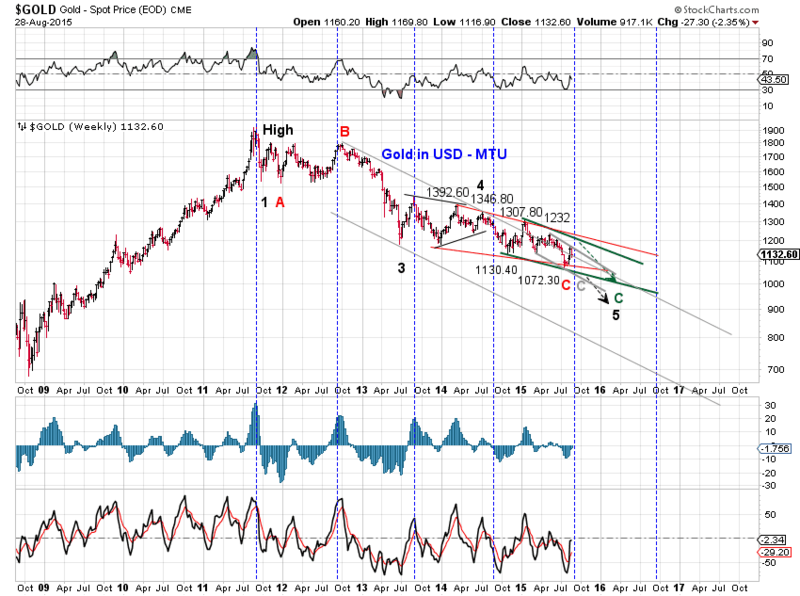 Furthermore, since wave (1) can be counted as a leading diagonal triangle under this interpretation, the breach of its wave [b] low (1980.90) as well as a 50% retracement could signal a retracement low. 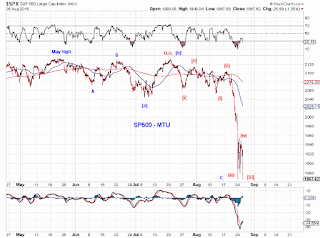 If the sell-off continues, the unfilled gap (1905.03-1909.38) presents a reasonable, but a deep, perhaps a too deep a, retracement target. gray wave (4) - with respect to the 2011 low. 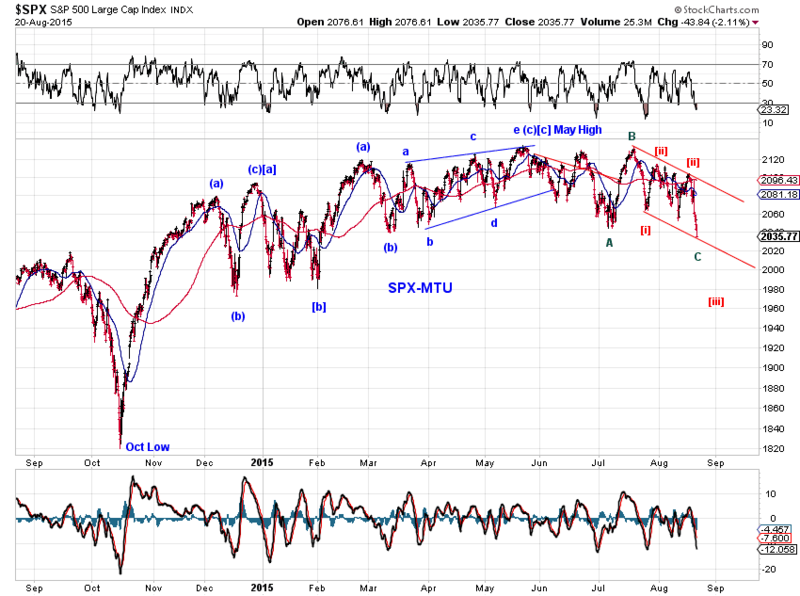 The gray count is similar to the green count, except for an extended wave (3) of , which terminated in 2015. Under this interpretation, the next upswing completes wave (5) of . 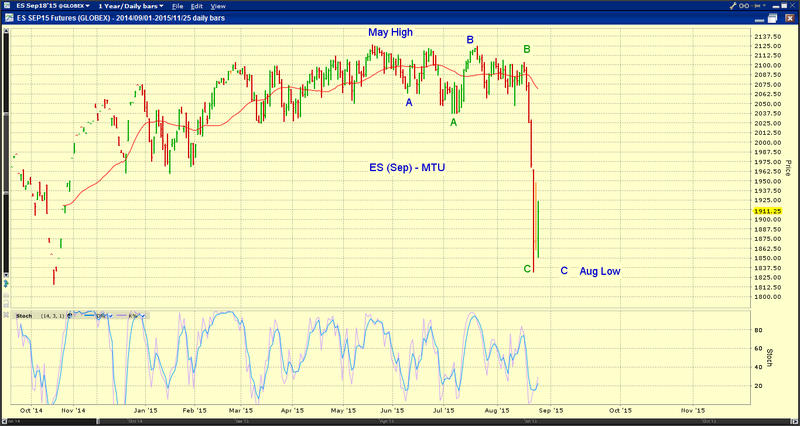 ES potential small-degree wave c/3 has extended. 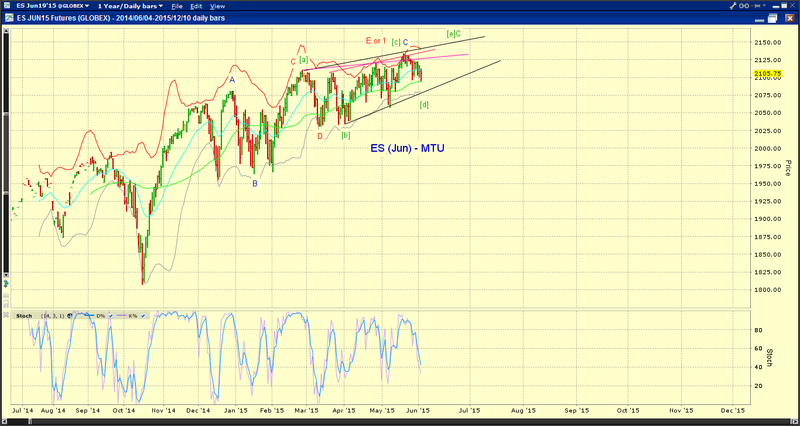 ES is probing "longer term" support. See chart. At last, SP500 breached its July low, setting a better footing for the next upswing - see recent weekend commentaries for details. See charts. 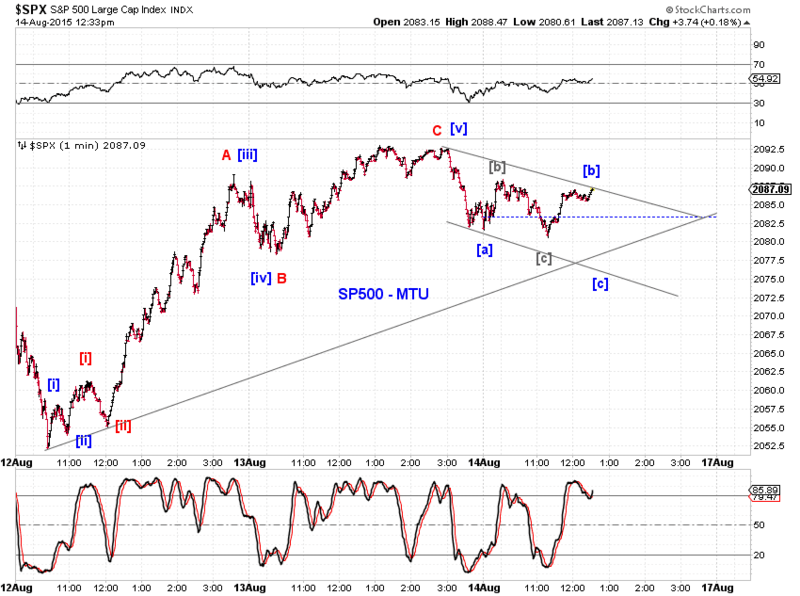 Diagonal- and triangle-type structure across indexes (Chart 1). 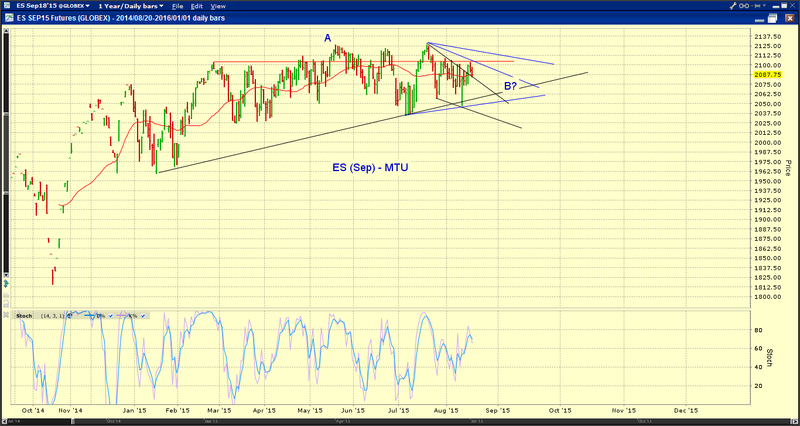 A potential diagonal-down from its July high in SP500 (Chart 2). 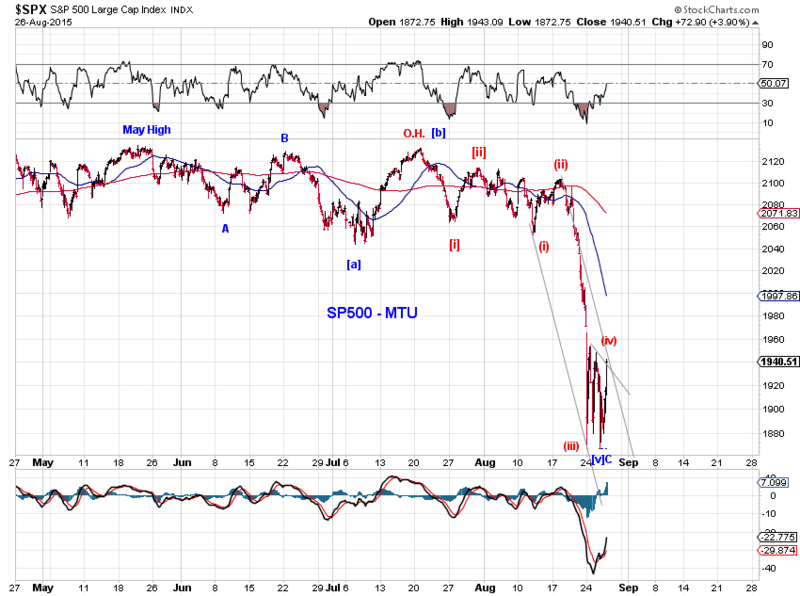 Moment of truth for a potential triangle (chart 1) or a relatively more bearish EDT (chart 2 red EDT). 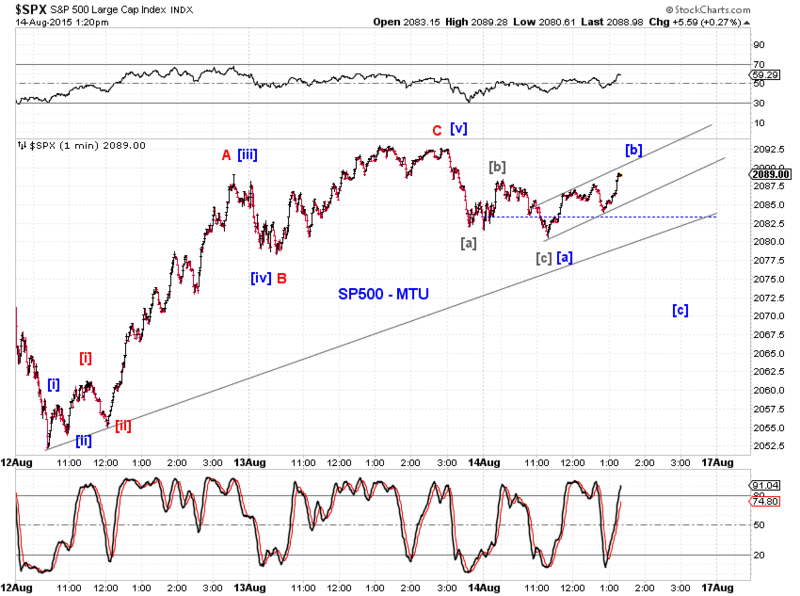 [330pm] SPX update - See chart. 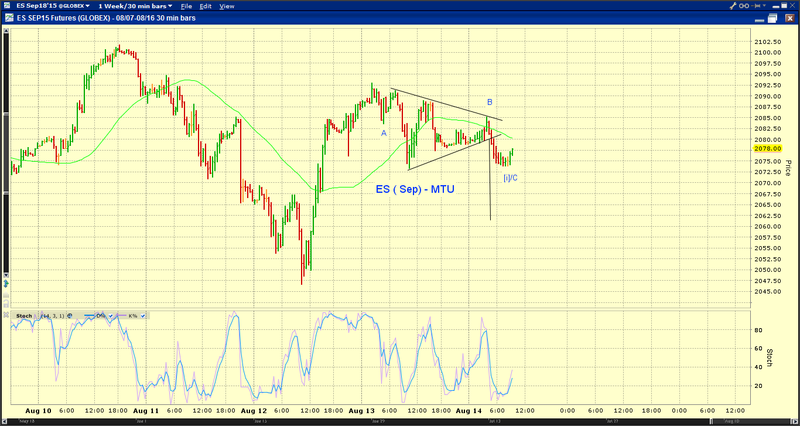 Potential triangle mapped into SP500 (see 825am ES update for details). [825am] ES update - See chart. Near term: The red 2015-overhead resistance line has capped the advance in ES once more and ES is probing potential breakout support. 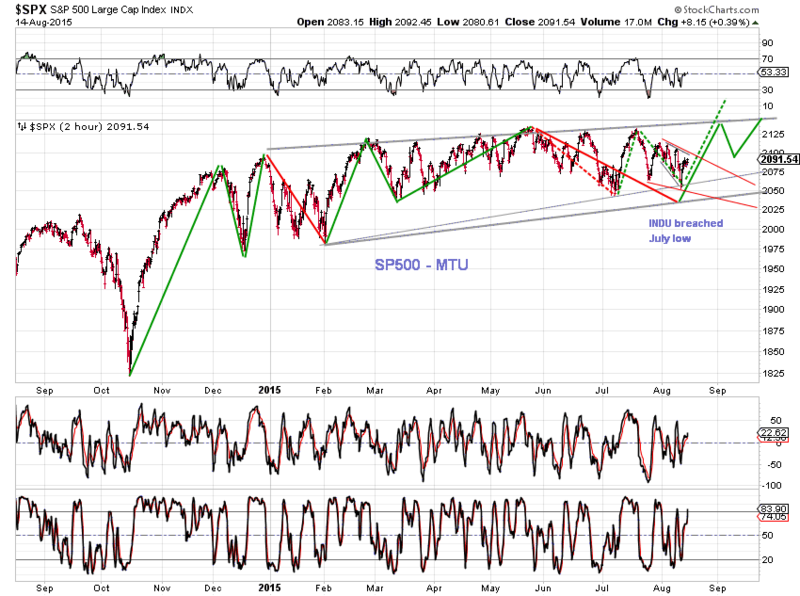 At larger degrees: potential blue triangle since the May peak? FOMC minutes at 2pm EDT. 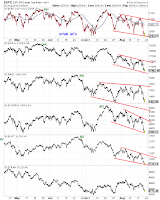 The three waves rise from the recent low in SP500 so far raises the short term bullish (green) and bearish (red and blue) counts in Chart. 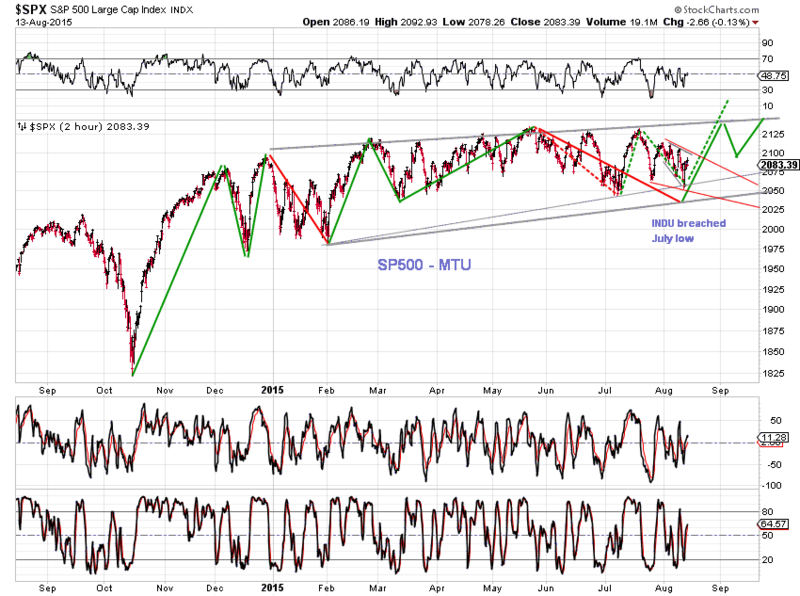 The pullback to 2052 in SPX this past week may be sufficient to "offer a more solid footing for the next upswing" (see Short Term Update(8/7/15)). 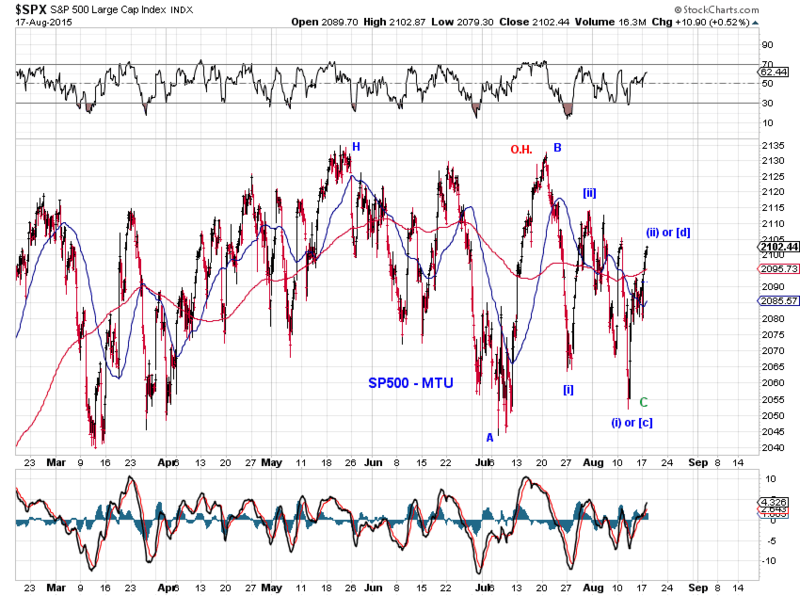 Another dip below the July low remains more ideal, but it is not required (Chart 1). 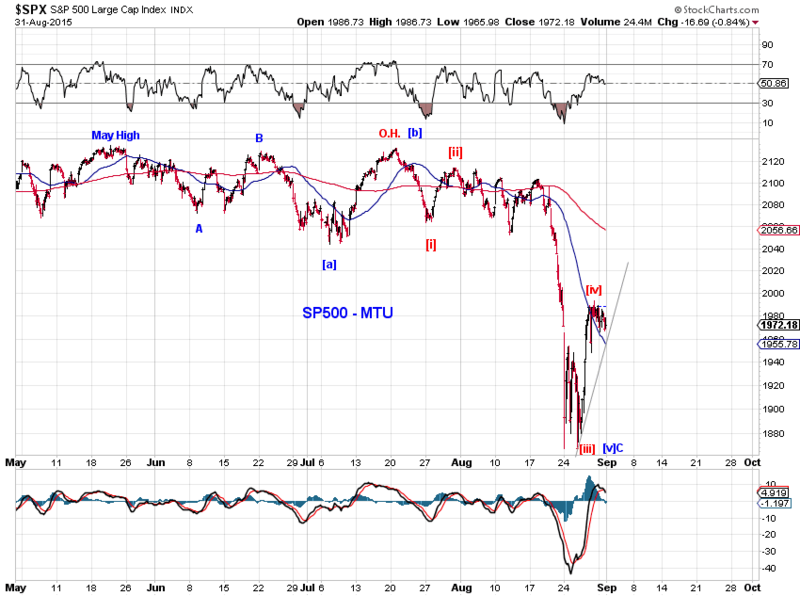 Let's see what the market delivers next week. 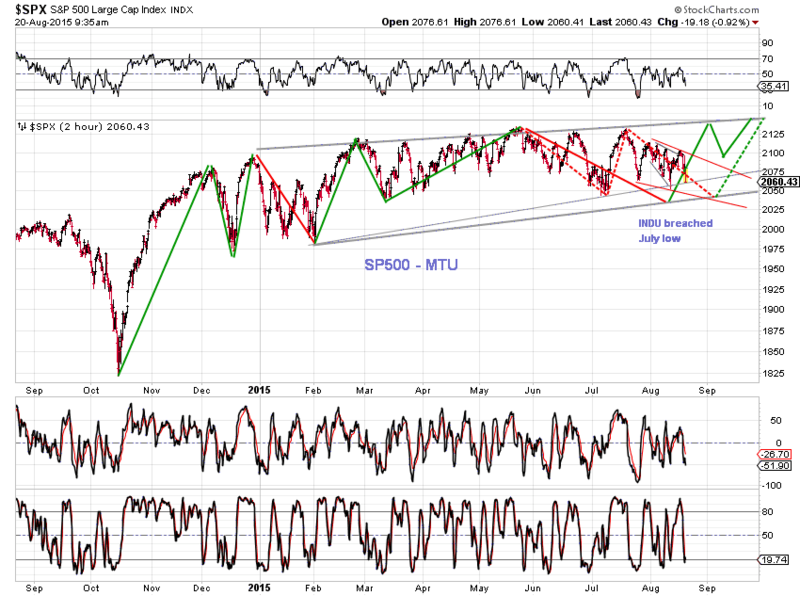 The rebound has brought indexes to both resistance and somewhat overbought levels (Chart 2). 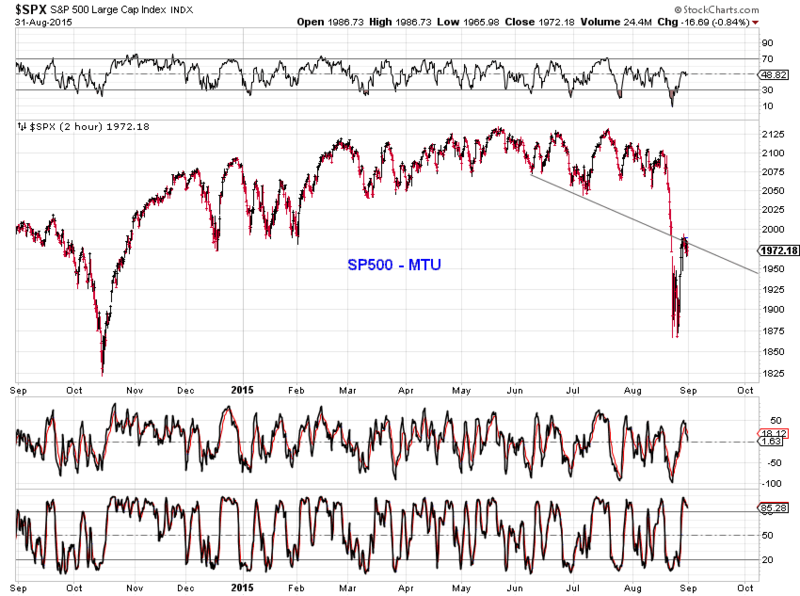 From a short-term bullish perspective,the cash market may gap above resistance at the open. 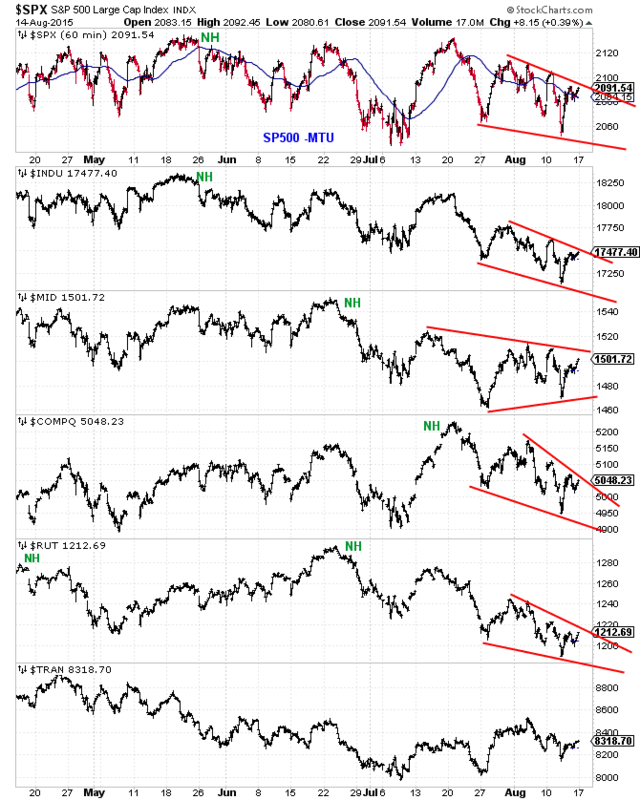 From a short-term bearish perspective, another decline will complete the triangles and EDTs highlighted in Chart 2.
short term tracking and squiggles. see charts. 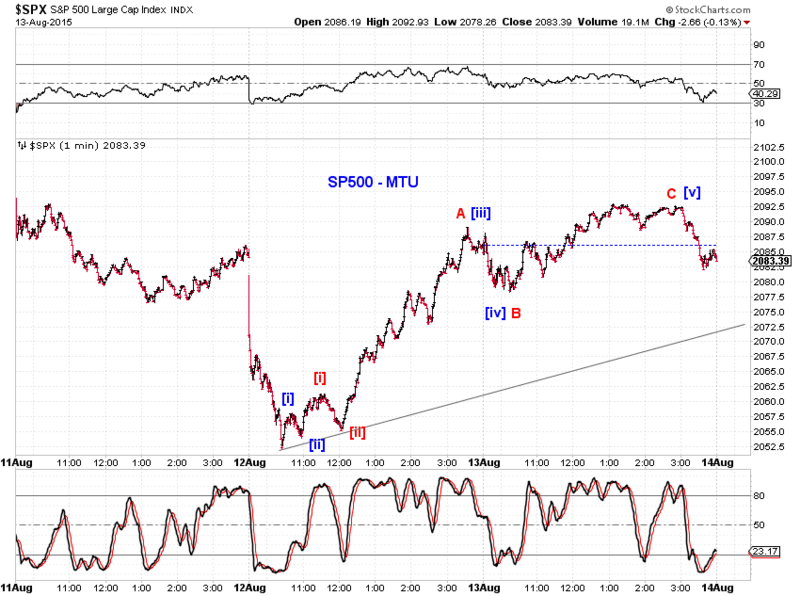 Pullback in progress (Chart 1), as a small-degree wave 2/B from a bullish perspective, or as wave E of a larger EDT from a bearish perspective (Chart 2). SPX is probing "new" potential support levels. See chart.